Hey everyone, in this issue of the Staxel Reporter we’ll be talking about Gamescom, seasons and the new animal expressions. Enjoy! 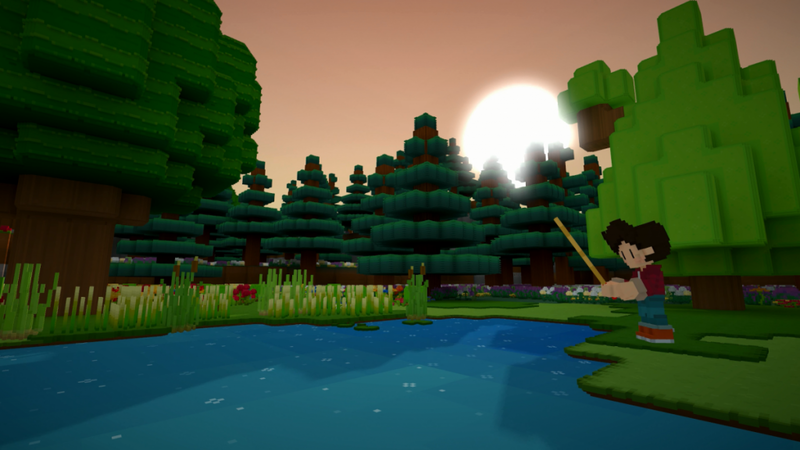 Staxel is heading to Gamescom! 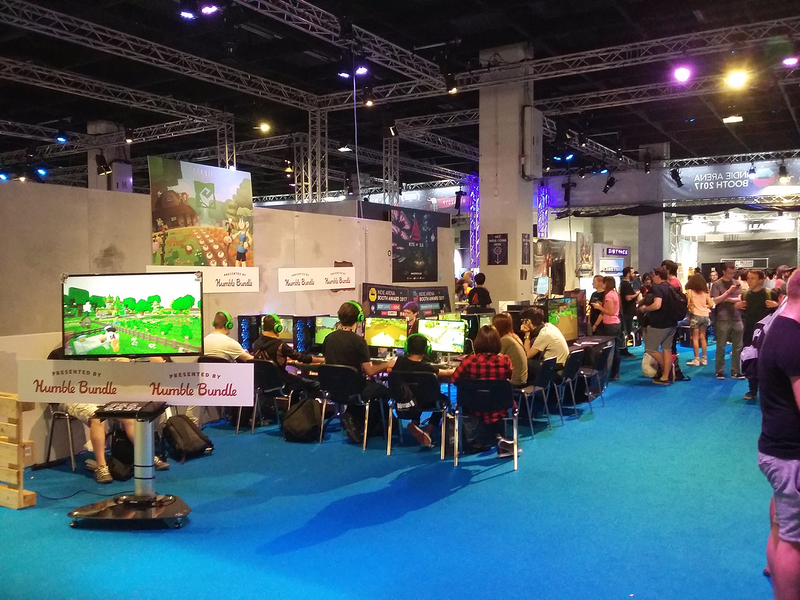 If any of you are at the upcoming Gamescom, please be sure to drop by our Staxel booth. You can find us in the Indie Arena. Hall 10.1, Booth A020, we’ll be in the Humble Bundle section. If you’re attending, be sure to drop by for some awesome stickers and a chat! 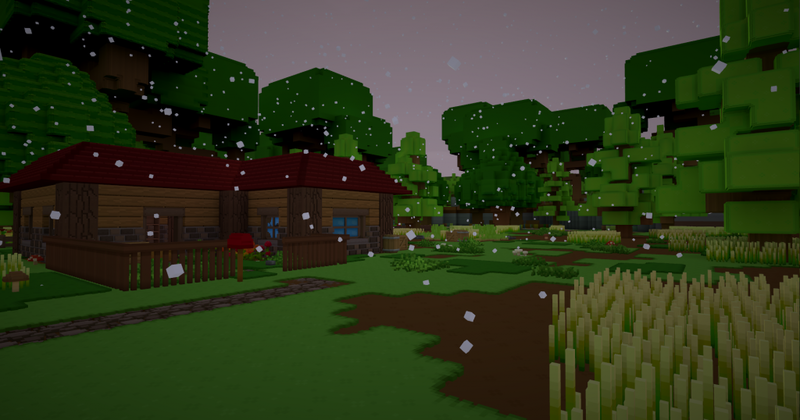 What’s a farming game without seasons? 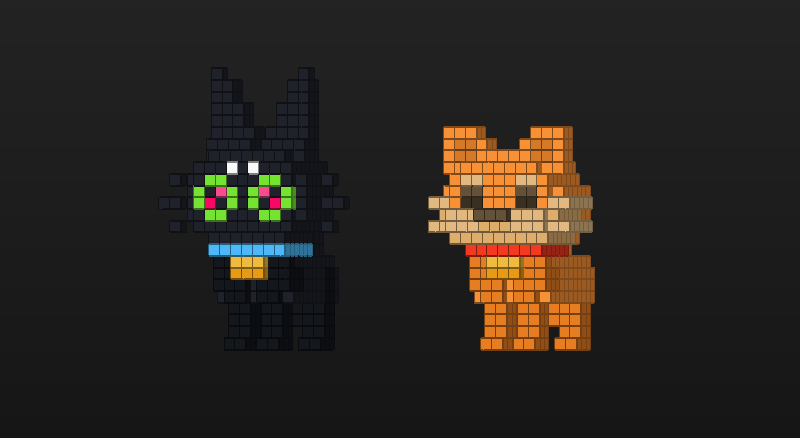 Who cares, we’re adding them to Staxel anyway! They’re still being worked on but they should be hitting the public build soon. 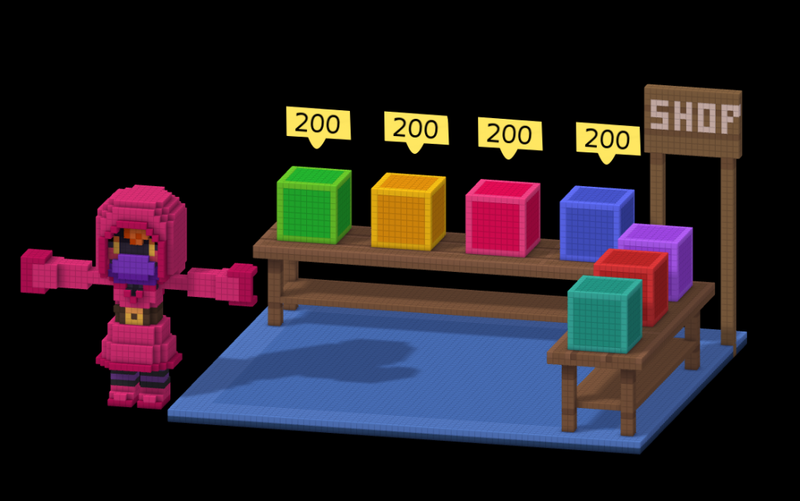 Let’s go over the new seasons mechanic and see what they add to Staxel. When creating the seasons, we decided to stick with the classics: Spring, Summer, Autumn and Winter. Each season currently lasts 10 in-game days, but we still need to do some playtesting to make sure 10 days is the right amount so this could easily change in the future. Not only will the world’s appearence change depending on the season, but the content will too. You’ll find the stores stock different goods, the wildlife will change, the weather will vary, and much more than I could simply list here! Crops can only grow in specific seasons. This means that you will need to do some extra work on the farm on each season change. That more or less sums it up for the upcoming seasons mechanic. It’s not in the public build yet, but you shouldn’t be waiting too long. Picture your favourite animal. Great, now picture it pulling a cute facial expression. So much better, right? That’s why we’ve decided to add facial expressions to all the animals in Staxel! You should play close attention to an animal’s expression as it will be an important tool for you. It will give you insight into the creature’s mood. You might find that something is off with your livestock, perhaps they’re not eating properly, or not being cared for properly. The first clue will be their mood. It’s important to keep your animals happy if you want to continue getting the benefits they bring. For example, a depressed cow can’t be milked, and a depressed pet won’t bring you gifts. The new animated expressions will prove to be vital in gauging the state your animal is in. Also, the expressions are super cute! That’s about it regarding animal expressions for now, we’re very happy with how they’ve turned out. We might need to add more expressions in the future too, so keep an eye out! Hey everybody, in this issue of the Staxel Reporter we’ll be talking about the new building sites system and take a look at the improvements to world generation. Enjoy! Something new that Joe’s been working on is ‘building sites’. A building site is placed down, and has completion requirements. 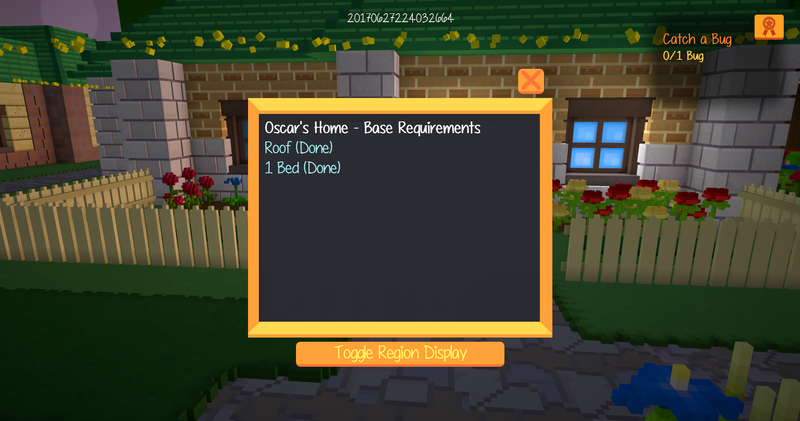 For example, if you wanted to build a villager house, you’d place down the ‘villager house building site’ and then complete all the required tasks. Now, how it works is every site has a special ‘totem’. This totem is a unique object specific to the building you’re about to build. Once it’s down you can interact with it and it will show you the outline of the building site and a check box of the complete and incomplete tasks. For example, a villager’s house has a ‘mail box’ totem. This system allows us to make the world interact appropriately with any new buildings you put up. Now a villager will move into a house you build! Also, if you tear down a villager’s house, or remove some of the essential parts, the villager will stay at the local tavern, and eventually move out if the house isn’t repaired! Now you may be a bit too busy running your farm to worry about construction work, but completing buildings can be very rewarding! You may be asked to build something specific as a villager quest, or you might unlock another game feature by building the corresponding building for it! This feature is still being worked on, and we’re still adding building sites but we’re very excited about this feature and we hope you are too. Callum has been hard at work polishing up and improving our current world generation. We’re going to take a brief look at some of the new stuff he’s been adding. Keep in mind world gen is still a work in progress and we still have more work to do on it! 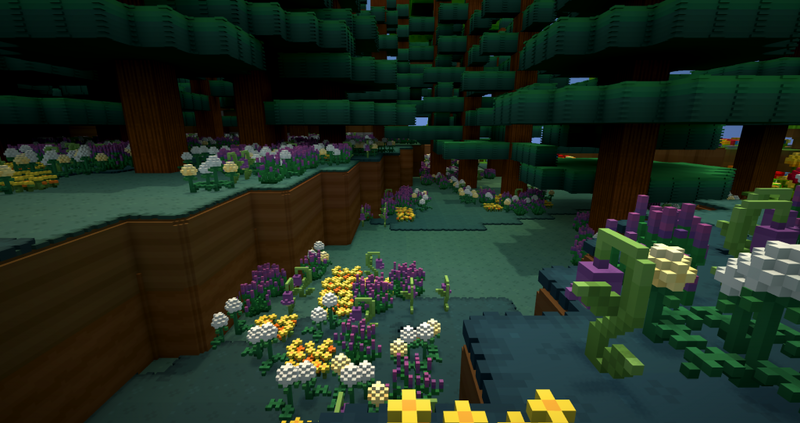 The meadow biome is a new biome recently added. Big fields of long grass with the odd tree here and there. A perfect place to sit down and relax after a hard day’s work on the farm. Don’t forget to bring a picnic basket! Like the forest biome, there will likely be items that can only be found here. So keep an eye out! 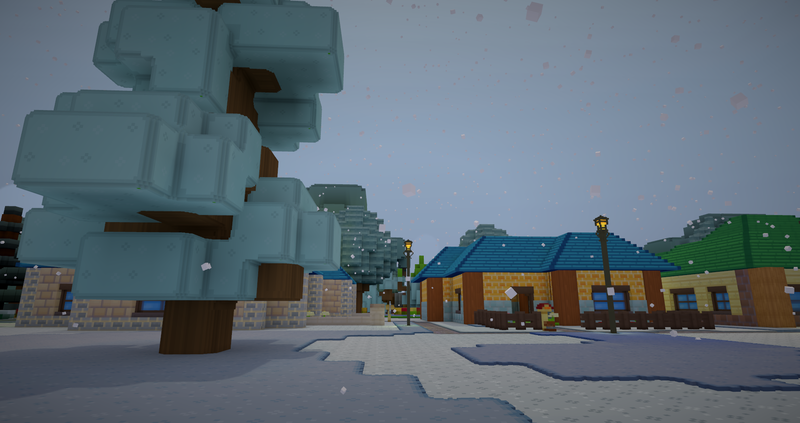 A huge, snowy mountain really ties the island together! If you fancy some hiking then grab your warmest winter gear and start climbing! As of now there’s not much to find on the mountain aside from a pretty view but we have a few ideas that I can’t actually talk about yet. Trust me when I say the mountain will serve an important purpose! Along with the new biomes, Callum’s been adding a lot of polish to the existing world gen to round out the sharp corners. Not only that but work’s been done to the village generation as well! Some of these changes are already in the public build so be sure to check it out! Hi everyone, in this issue of the Staxel Reporter we’ll be talking about the airship port and take a look at the new water. Enjoy! We’ve all been very busy lately and a lot of new features are being worked on. That said, right now I’m going to focus on one specific feature I’m very excited about. The airship port! Now, it’s still being worked on, but the basic functionality is there, and a very early version of it is already in the public build! I’ll give you some insight on what to expect from the finished version. Above is a pic of the current, but still work in progress, airship port. Obviously it’s missing the airship and various other things but this is what it will look like at a very basic level. Now, the airship port is going to be the main gate of entry and exit for all the villagers and NPCs in your village. If one of the villagers is unhappy with the town, or if *someone* wrecked their home, they’ll head over to the airship port and prepare for departure. This will give you time to make any amends/repairs necessary to keep them from moving out. Also, any new villagers moving in or old villagers returning home will arrive at this station overnight. Introducing Cloudbeard! Not only is he the pilot, but he’s a merchant too. 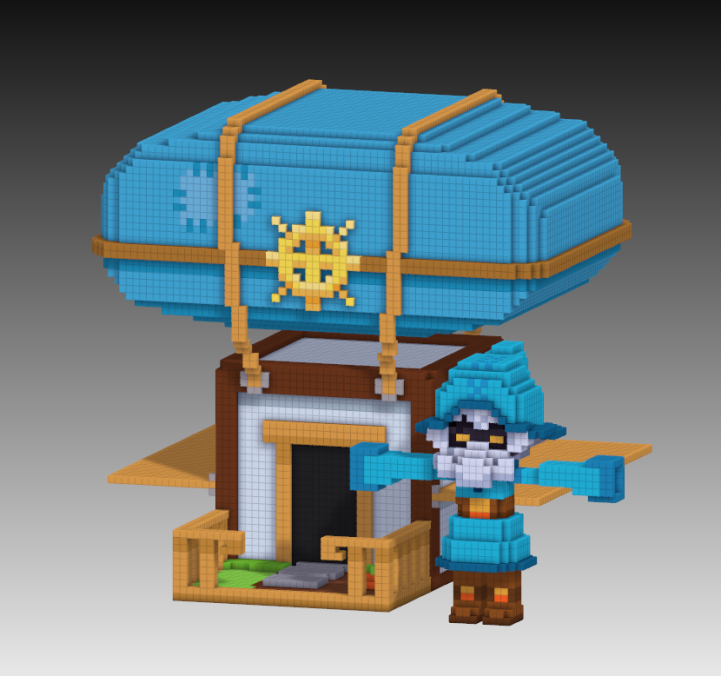 Cloudbeard sells rare and exotic goods that he’s picked up on his travels. Now they might be a little pricey, but they’re worth every petal! The items he sells can’t be found or purchased anywhere else, so if you’re in the market for some unusual goods from a distant land, Cloudbeard is your man! And there you have it. The next update should contain a much more polished version of the airship port, so keep an eye out! At long last we’ve finally started addressing water. We’re going to take a brief look at the new water and talk about what to expect from it in the future. We have a brand new water block which is now swimmable, fishable and looks pretty slick to boot. 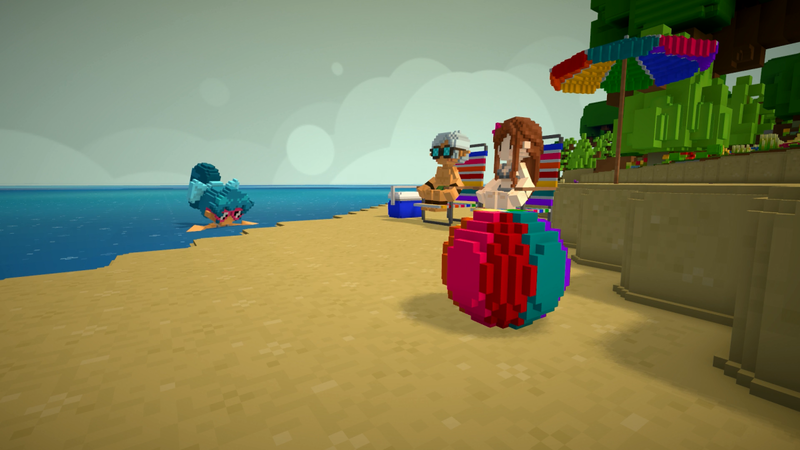 Somewhat related, we also have a few new breeds of fish for you to catch at the beach, so if you’re one for fishing then it’s time to hit the beach! While we’ve made some big improvements to the water there’s still some work to be done. We’re going to try and make it even prettier with some nice sparkling effects. We’re also currently figuring out how the water should behave. Until then, water can be dug up with tools and placed like any other block. That about sums it up for the new water. 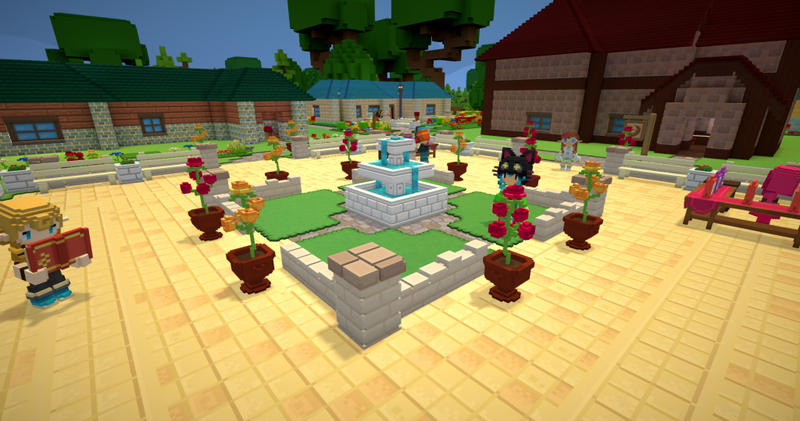 The water in the public build is already updated but expect further changes in the future! Hey everybody, in this issue of the Staxel Reporter we’ll be talking about biomes and take a look at the new pets. Enjoy! 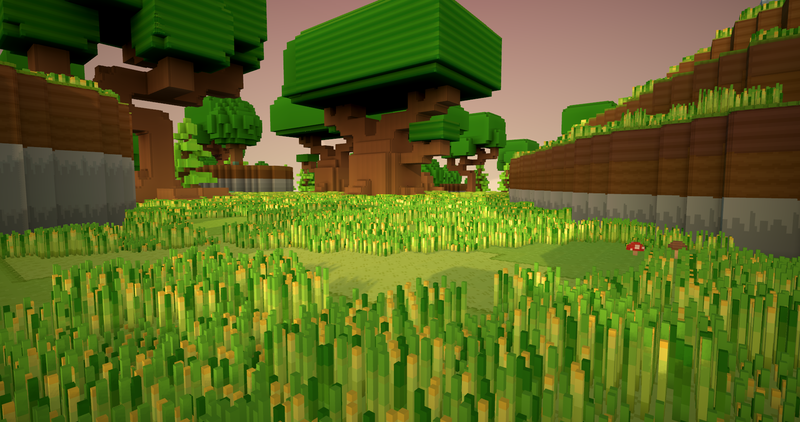 Many of you will be excited to hear that we’ve recently begun work on adding different biomes to the Staxel world! Let’s take a look at what’s in the works. 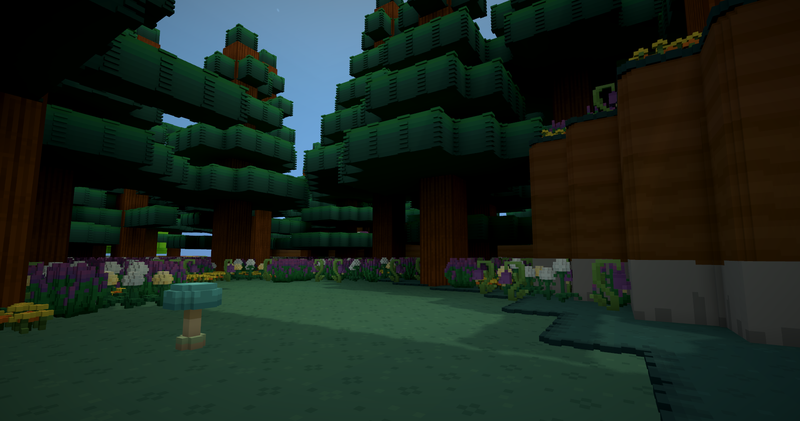 The forest biome is the first biome we started working on, and as we only recently started working on biomes it’s currently the only one that’s screenshot ready. Right now it doesn’t offer anything other than a pretty zone on your island, but we aim to give different biomes real purpose so in the future you might find cool stuff in there that you won’t find anywhere else! 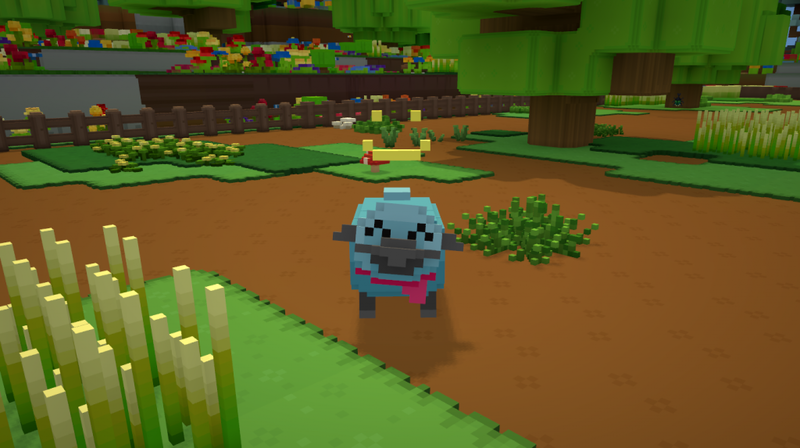 The variety of pet breeds in Staxel has just grown! Before, at the end of the tutorial you could only recieve one type of breed for both cats and dogs. Now, however, you’re rewarded with a pet of a random breed! But who cares about what I’m saying? Let’s look at some cute pet pictures! D’awww, just look at these adorable dogs! The new breeds are bloodhounds, dalmation, and border collies. There may be more breeds in the future but these should do for now at least! Now let’s put the dogs safely away and bring out the cats. You have no idea how hard it was to get them to line up for this picture… does anyone have any antiseptic? Anyway, here they are! We’re hoping these extra breeds should help your pet feel a bit more unique to you. That about sums it up for the new pets. We’ll certainly be adding new pets in the future other than cats and dogs, so there’s more to look forward to in the pet department! Hi everybody, in this issue of the Staxel Reporter we’ll be talking about how our visit to EGX Rezzed went and take a look at the new merchant district currently being worked on. Enjoy! 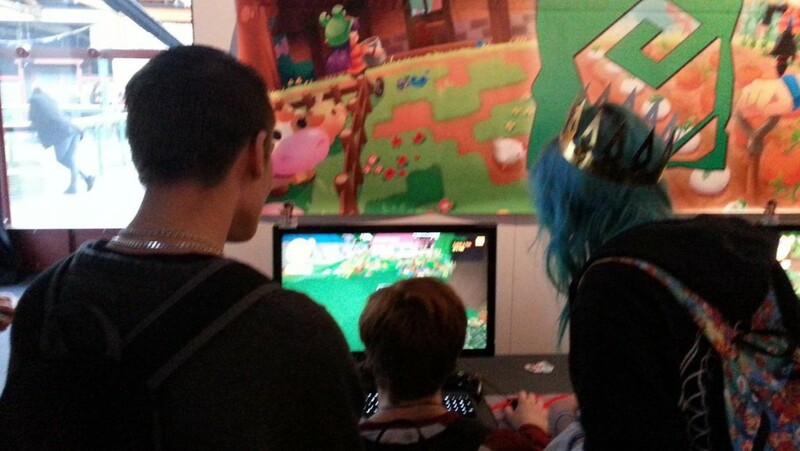 If you’ve been following our social media you’ll know that a few of us went to EGX Rezzed in London to exhibit Staxel. This will be a little update on how it went! I’ll start off by saying the convention went amazingly! All of us who went have done a good few conventions between us, but we all agreed that EGX Rezzed was our best one to date. We got so much positive feedback and a lot of useful input, it was awesome seeing so many people excited for Staxel! A few of our community members even dropped by and hung out with us! It was really great to put faces to the usernames we’ve been talking to for ages now. We brought 500+ stickers with us just so we didn’t run out, we never print enough. Well, I’m very proud to announce one of my biggest achievements in life. I handed out the very last sticker within minutes of the closing of the last day. Yep, you read that right, I’m amazing! We also met a lot of the other devs exhibitting their own games. 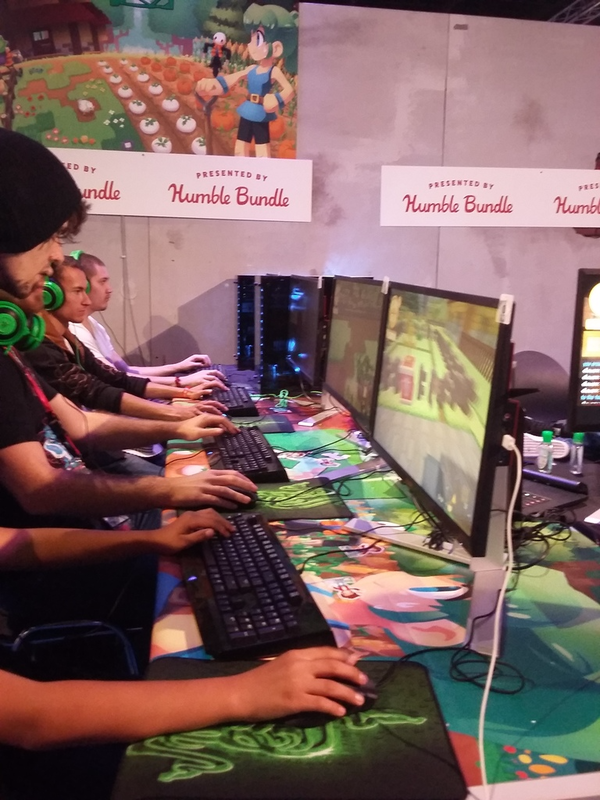 We saw so many promising games being made by some very talented devs, and had a blast trying them out! We made a huge list of input we got from the players, and also things we noticed players struggling with. Since we got back, nearly two weeks ago now, we’ve had some calls and injected all the issues we found into our development plan. We’ve fixed quite a few of the issues found at EGX Rezzed already, but still have more to go! All in all, EGZ Rezzed was absolutely awesome. We all had so much fun and was definitely worth doing. We made some friends, got a lot of positive input and grew our buglist even more. Well, it’s important to find bugs sooner than later! Among many other changes, we’ve given the merchant zone a second pass. It’s not totally done yet but it’s close so today we’ll be having a look at what’s changed there. Currently 4 merchants sell their wares behind some counters in the town square. Not for long though! 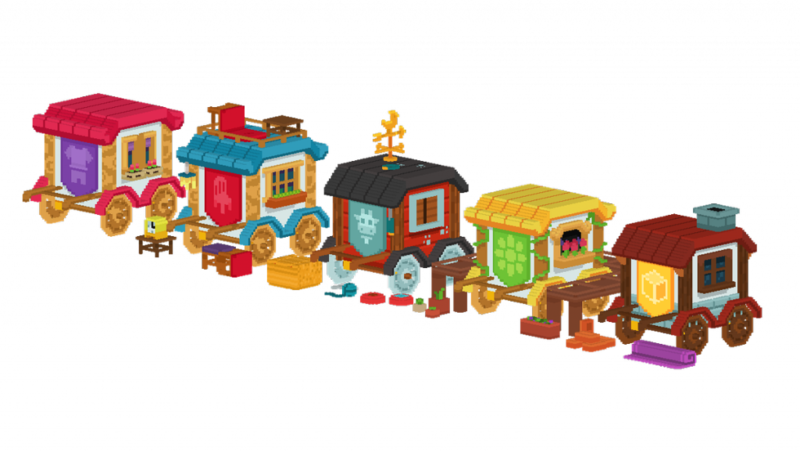 Each merchant has been given their own cart to sell their goods at. With each design unique to the store type, this should really pretty up the vendor zone. The merchants seem happy at least! As these carts take up so much space, they’ve also been graciously gifted a new plot of land by the Mayor. Thanks Mayor! 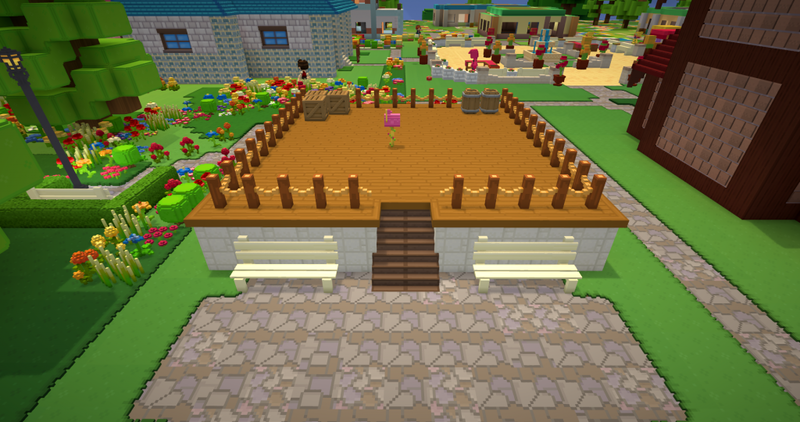 The new ‘market district’ is a small plot of land just below the town square with enough space for all the current carts, and extra space for any future merchants who show up! With more merchants, browsing goods will be more fun and you’re more likely to find something you’d like to buy! Right now the new merchants stores are ‘building, animals, seeds, clothing, and furniture’, so there’ll be plenty to choose from! That about wraps it up for the new merchant zone, as I said it’s still a work in progress but you won’t need to wait long for it to go live as it’s nearly done. Thanks for reading! 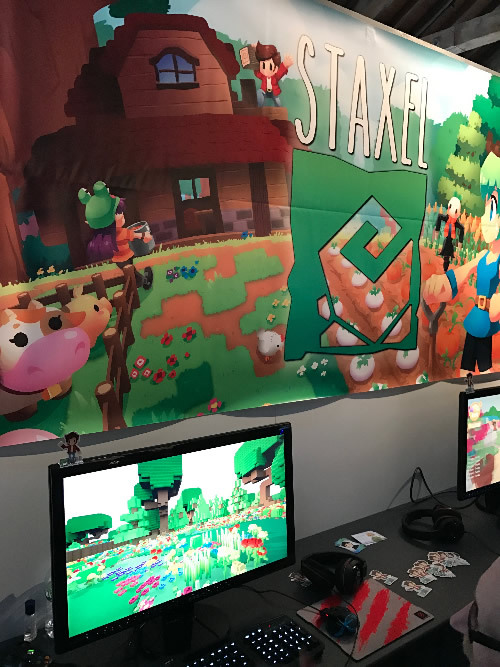 Hey everyone, in this issue of the Staxel Reporter we’ll be talking about the upcoming EGX Rezzed we’re attending and also have a look at a general development update. Enjoy! It’s only been two weeks since we took Staxel to San Francisco and now that we’ve had a little breather we’re getting ready to take it out again. 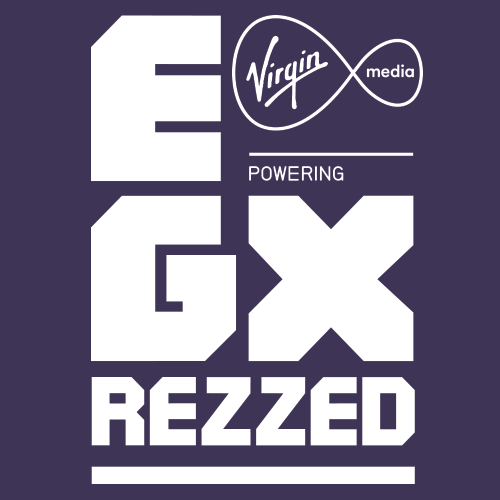 This time it’s EGX Rezzed in London! EGX Rezzed is a gaming event that stems from the larger EGX Convention normally held in Birmingham. One of the main differences is that Rezzed has a stronger focus on indie games. 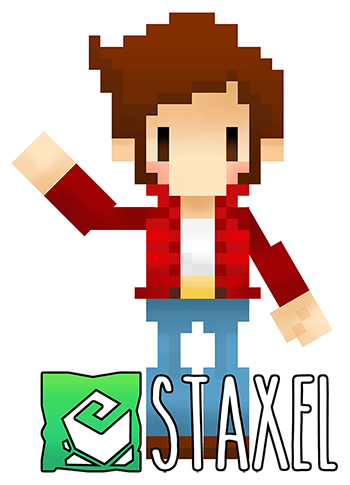 We’ll be exhibiting Staxel at a stand in the expo for the entire length of the convention, so if you’re planning on attending, be sure to come and pay us a visit! It’s always exciting for us to be able to see people play Staxel and get their feedback and first impressions on the game. We’ve had a giant banner printed out specifically for the event so don’t worry, it’ll be very easy to find us. As usual, we’ve printed out a bunch of stickers to give away at the event. If you see us, make sure you come over a grab a few to add to your collection. EGX Rezzed is taking place on Thursday 30th March to Saturday 1st April at Tobacco Dock in London. We’re really looking forward to meeting people from the community and if you aren’t attending, don’t worry, we’ll give you a full update on the event in the next issue of the Staxel Reporter! Today I thought I’d give you an overview on what we’re currently working on in preperation for the upcoming convention. I won’t be going into much detail, but you can expect a more detailed look on some of these in the near future! 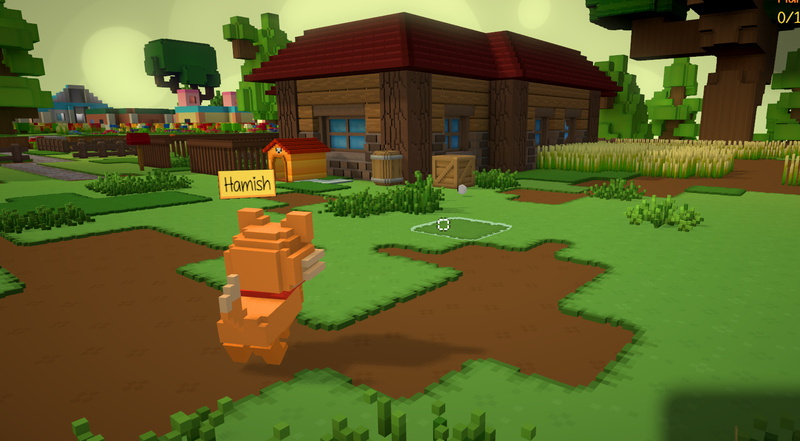 Callum is currently working on pet games, starting with ‘fetch’. It’s already working pretty well! This’ll add some more interaction between you and your adorable pet. Phil is doing work on the furniture store. The furniture store is going to be a building, as opposed to the market stalls found in the town square. Stock will cycle every day so be sure to check it often! Speaking of furniture, Razz is working on a new furniture set! Expect to see more about that soon. Joe has been working on an improved starter tutorial. You now start out in the town hall and Farm Fan gives you a tour around before leading you to your farm. This second pass to the tutorial will be a much smoother intro to Staxel and some of it’s features. With EGX Rezzed coming up fast, Conor is running around doing all high priority art tasks as they’re requested. Things are getting pretty busy as they usually do before conventions. Conor, we need boulders, stat! Bart is working on optimisations and bug fixing to ensure a smooth experience for our players at EGX Rezzed. As you can tell we’re incredibly busy right now and will be for the next two weeks at least, but we’ll be sure to keep you posted with all the fun stuff! Also, if you haven’t already, be sure to check out our discord community! It’s a pretty casual server where you can find out the latest info or just have a chat with us and the rest of our community. We hope to see you there! 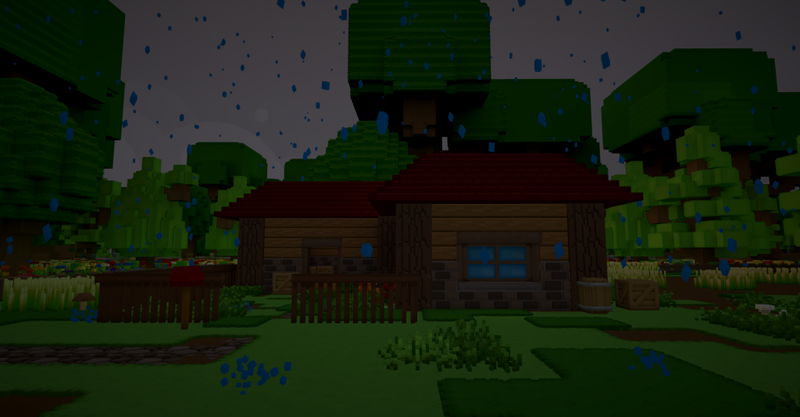 Hi everybody, in this issue of the Staxel Reporter we’re going to show off the new villagers, and take a look at the new village! 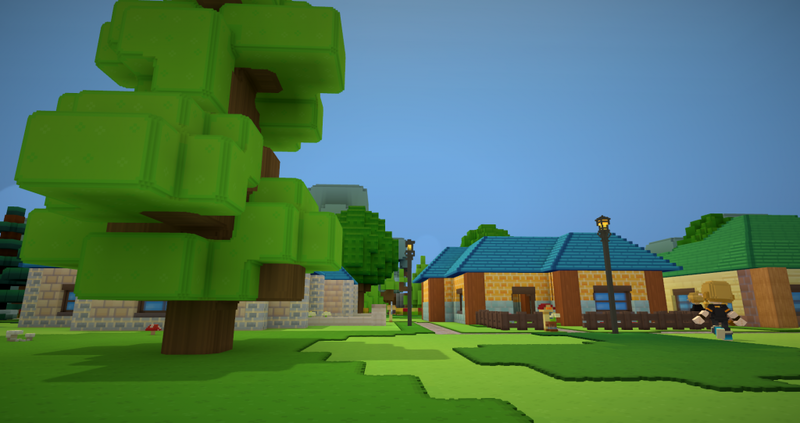 The first pass of the village is finally done and in-game! That’s right, if you start staxel up now and create a new world, you’ll notice a path that leads from your farm directly to the new village. So let me give you some juicy details before you jump in-game! After our first village build we realised we weren’t happy with the current selection of blocks. They all seemed a bit too gloomy, so SteampunkStein did some experimenting and came up with a fresh style and a bunch of new blocks! Using these new blocks we built a house for each one of the new villagers. The buildings are likely to change in design in the future but it’s certainly a start! Each villager has their own home and will always head back to it when they’re finished with their business in the village. There are also some ‘special’ buildings. Right now we have a town hall, a tavern, and a grocery store. The town hall is where the Mayor can usually be found during the day. The grocery store is stocked full of cooking ingredients and other necessities and the tavern is ready to serve you after a long day of outdoor work. The town square is basically the heart of the village. It’s usually bustling with busy villagers and usually it has market stalls with merchants trying to sell you and other their wares. In the future, however, the town square will also be a place that hosts festivals and celebrations! As I said, this is only the first pass on the village and still needs a great deal of work. That being said, we’re very happy with how it’s all coming along and we can’t wait to see how far we can push it! We recently introduced you all to ‘farm Fan’, our first villager… well now we have a whole village worth of them! Now they’re still early in development but I figured it’s still worth clueing you all in on what stage they’re at.The villagers are in the public release already so if you want to check them out for yourself just hop in-game! Right now we have several villagers all with temporary designs which will change in the future. Even so, they all have a unique personality and look about them already! When joining and moseying on over to the new village, you’ll find it buzzing with village life as the locals go about their day. 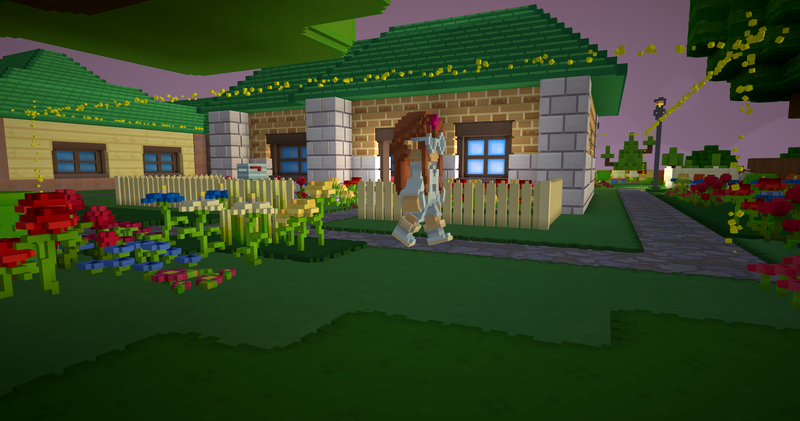 Right now you can have a very brief, one way conversation with the villagers, but we still have work to do until all the planned functionality is there. You can usually find them hanging out in their homes, the town square, hanging in a ‘chill spot’ or sometimes even the tavern! Some villagers, however, play a special role in the village and depending on that role changes their behaviour. Maximillion the Mayor, for example, will usually make time in his day to go to his office in the town hall while Rowan stays loyally stationed in the tavern, ready to serve thirsty villagers and farmers alike! We will carry on improving the villagers until all our plans for them have been achieved. There’s still plenty of work to do but we’re making great progress! 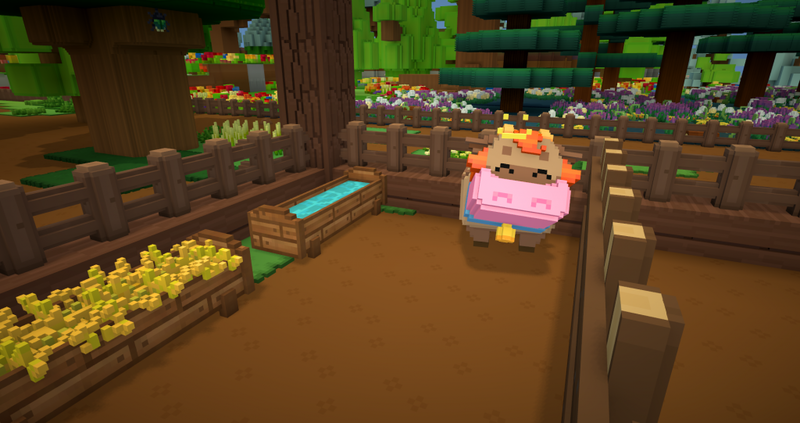 Hi everybody, in this issue of the Staxel Reporter we’re going to show off the new villager, ‘Farm Fan’, and take a look at the new pet system! We’re very excited to introduce you all to ‘Farm Fan’ (we asked her for her name but this is all she’d give us). 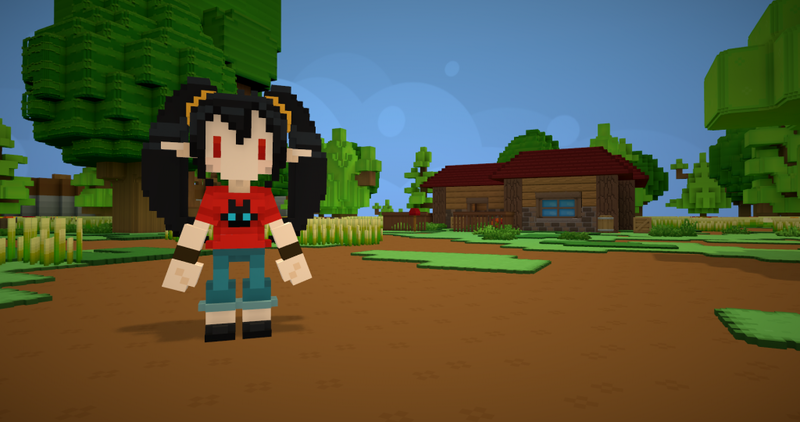 She’s the first villager you’ll meet when beginning Staxel for the first time! She is an absolute farm fanatic, completely hooked on all aspects of farming! We’re talking posters of farms on all her walls. 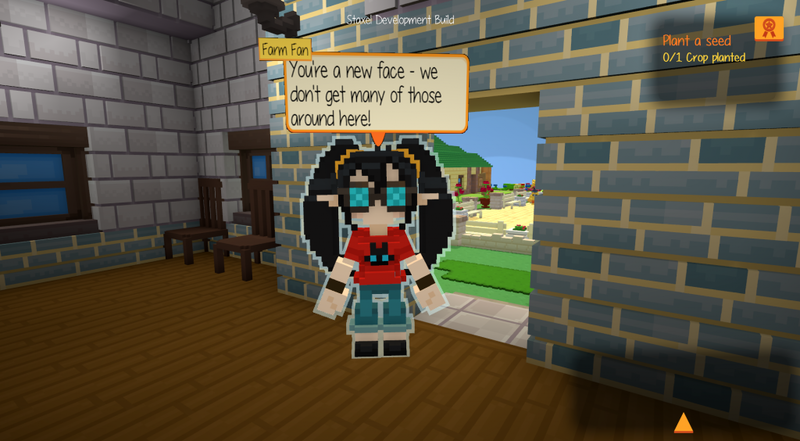 She has an abundance of knowledge when it comes to farms, and she’s excited to help you get started with your role as the village’s new farmer! She can be a bit pushy, sure, but she just loves farming so much. Note: Her design hasn’t been decided on yet so she’ll likely look different in the future. When you start out fresh on the farm, she’ll visit and ask if you need any guidance on getting started. She’s really quite clever and will walk you around the farm showing you the important parts. She can teach you how to use tools, how to plant crops and tend to them properly, how to ship your goods and much more! She does her best to explain things thoroughly so you don’t feel like you’ve been thrown in the deep end. If you’re pretty satisfied with your farming knowledge you can tell her that you don’t need any lessons and she’ll head back to the village where she’ll continue about her day. She’s just another villager after all. A villager with an intense obsession with farms. If you ever change your mind though just strike up a conversation with her, she’s always happy to give advice! 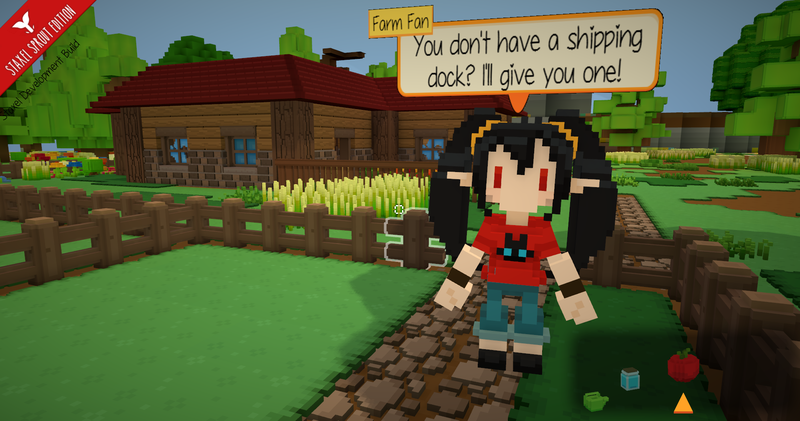 We feel ‘Farm Fan’ will be a great help when introducing new players to Staxel, and we can tell she’s excited to help! 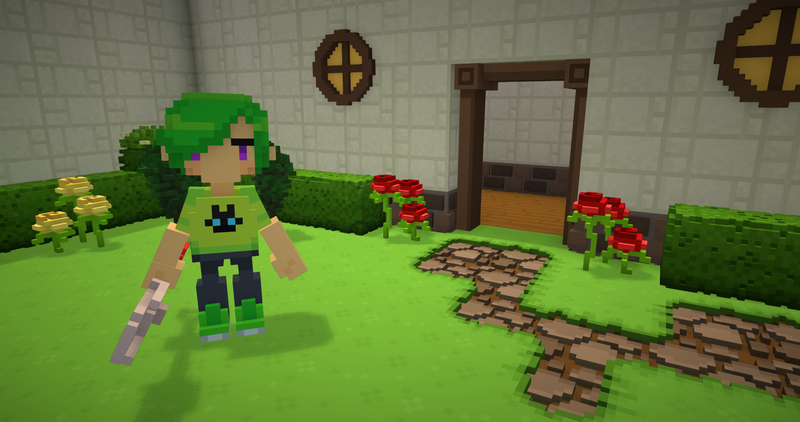 She marks an important milestone as she’s Staxel’s first villager. The first of many! I’ve been excited to talk about this feature for a while now, and I can finally give you all the scoop. The first pets have recently been added! It was inevitable really, who can imagine a lively farm without its resident dogs and cats scampering about? Every pet needs a pet house and a food bowl, these are important when it comes to pet care as a neglected pet will become sad and disobedient. If you love and care for them properly, a happy pet will sometimes bring you a gift to show it’s appreciation. You might have noticed the little area next to the pet house in the picture, that’s where your pet will deliver any presents it finds for you, so make sure to keep them happy and well looked after! A happy pet is a loyal pet, your companion will follow you around while you perform your day-to-day tasks, so no slacking! You need to set a good example now that you’ve got a cute little best friend on your heel. If you’d rather let your pet play while you work though, you can tell your pet to relax and it will stop following you and just hang around. 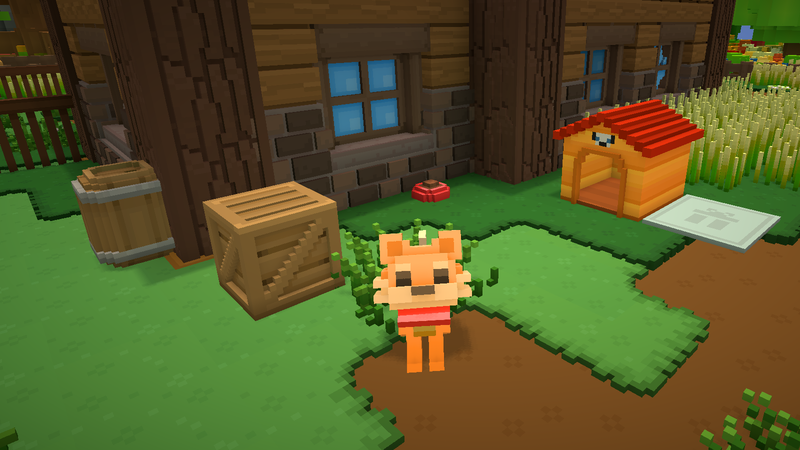 As of now, at the start of the game you will have an option between either a cat or a dog, but we’ve got some other plans for pets in Staxel too, not only will there be a selection of colours for your dogs and cats, but we’re thinking of adding other domestic animals at some point in the future. I can’t go into it just yet as nothing’s been decided, but be on the lookout for new types of pets somewhere down the line. 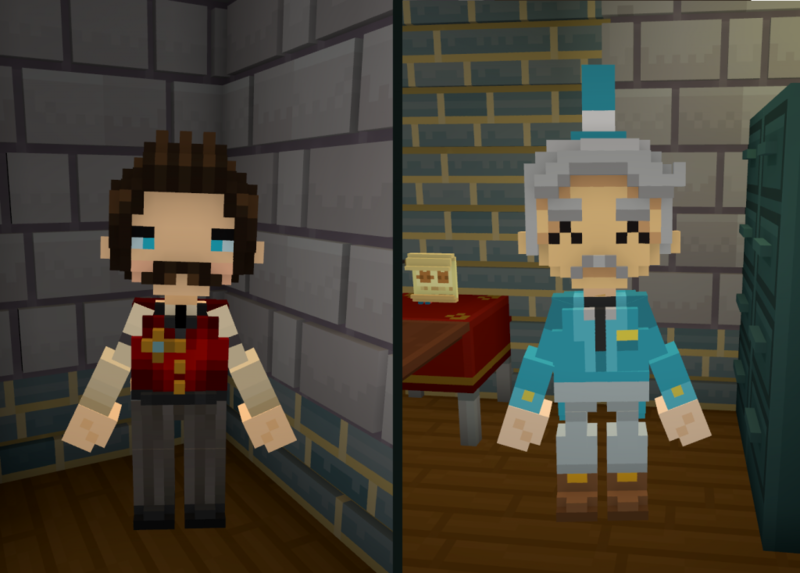 Hi everybody, in this issue of the Staxel Reporter we’re going to talk about our new development focus & take a peek at merchants which are currently in development. Back after the holidays, the team’s at full capacity again working on Staxel. At the end of November we had just finished a major milestone, ‘Sprout Edition’, which had a heavy focus on the farming aspect of Staxel. 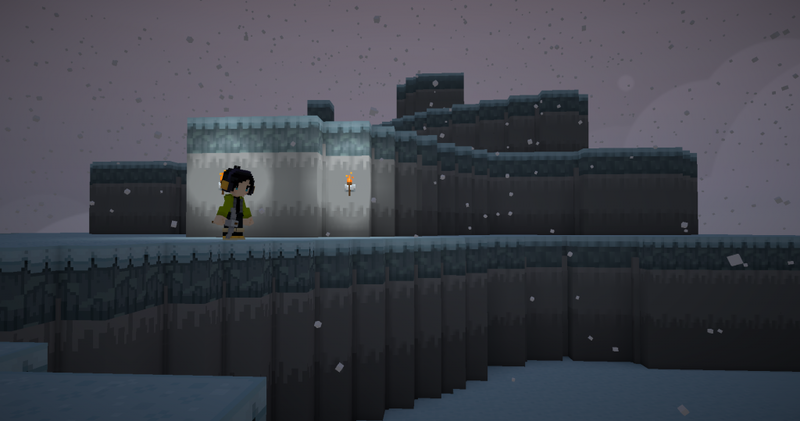 Before we began working on our next milestone, we took the month of December to work on our own features within Staxel as a way to wind down a bit throughout the holidays. We actually got some very cool stuff out of it. Here’s a few pictures of some of the features we added over December. Our community worked on a Christmas village throughout December, so Joe added some snow! So far you’ve been starting out in an infinite world, but what we’re planning is that you’ll actually be starting on a randomly generated island of a fixed size. The shifting seasons will have a big impact in your farm life so best be prepared! 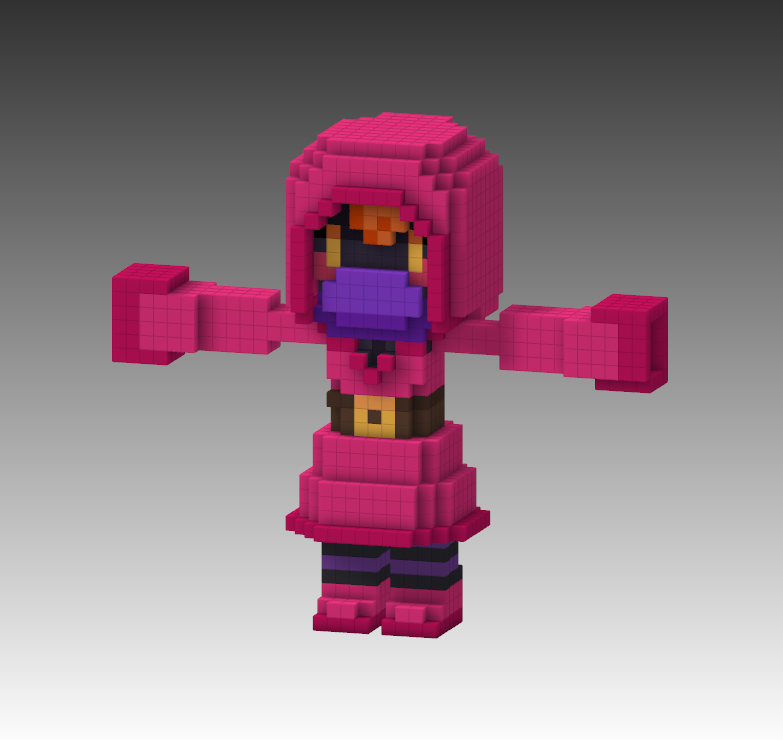 We’re finally starting work on villagers. These residents will breath more life into the village. Talk to them, play with them, do them favours, and befriend them. They are your neighbors after all! Merchants will be the retail connections who allow you to purchase equipment, furniture, clothing and almost anything else you could think of. You’ll be able to sell your produce and the items you gather on your travels to Merchants too. A village wouldn’t be a village without houses, literally. We’ll soon be working on the village where your friendly neighbourhood villagers will reside. 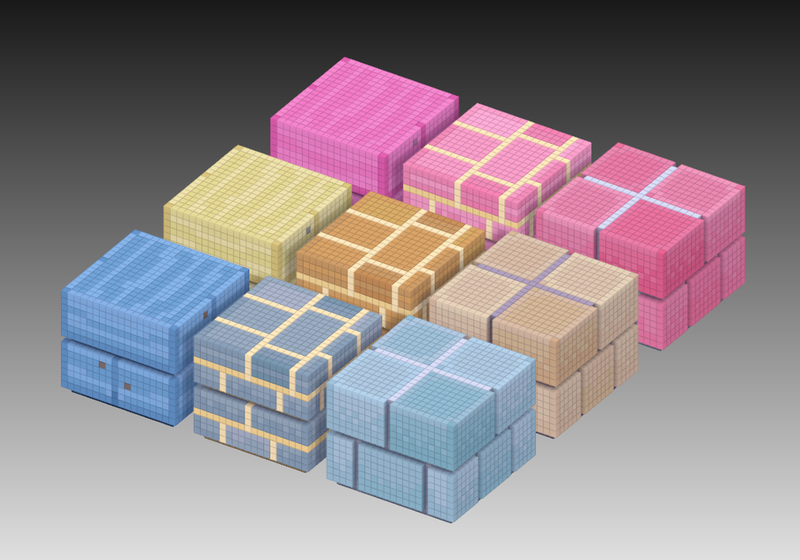 This also means new building materials so keep a lookout to spot these in-game. Now let’s kick off the new year with the fireworks Callum added! 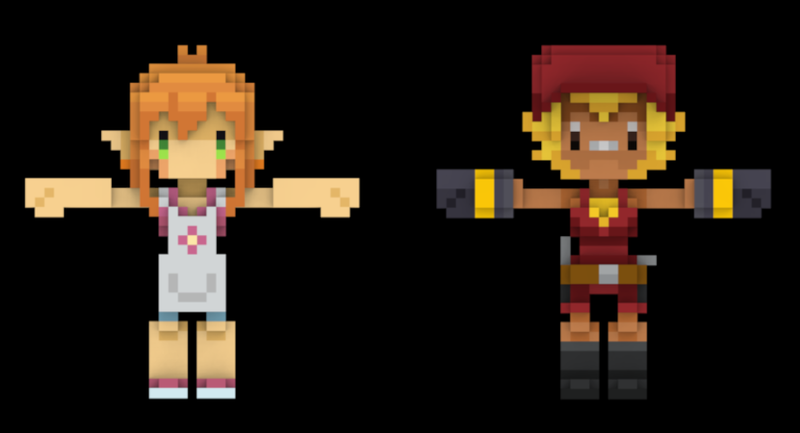 We’re very excited to be working on the rest of the Staxel world and we have so many ideas! 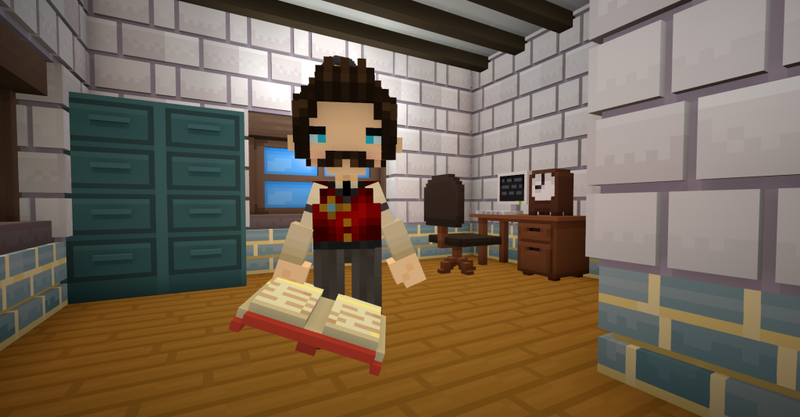 I only mentioned a small amount of what we have planned for this milestone so be sure to keep an eye out for future Staxel Reporters for more insight on the upcoming new features. Remember to follow us on twitter, facebook, reddit, our forums or subscribe to this newsletter for the latest updates on Staxel! Also, if you fancy a chat with our community or us devs, join us on our discord server! We’re currently working on adding merchants to Staxel. 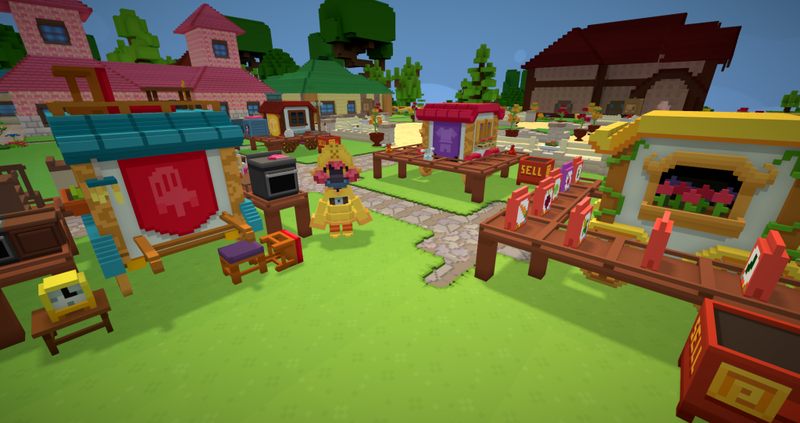 So far all buying has been done through the in-game Honey.Comb catalogue, however, we want players to hit the town with their hard earned petals and go on a shopping spree! Here’s a mock up of one of the merchants Conor did. This merchant will be selling their goods at their own market stall. Store inventory changes every day so be sure to keep checking back if you’re trying to find the last item missing from your furniture set! Here’s an early mock up of what the vendor’s station could look like. It’s very likely to change but this should give you a rough idea of what to expect. We’re still figuring out some of the specifics with merchants. For example, we’re thinking you can only buy things from your catalogue you have owned before. As we’re still working on merchants and still figuring out their finer details some of what you’ve read here could possibly change, but we’re really happy with how things are going and we hope you’re as excited as we are!